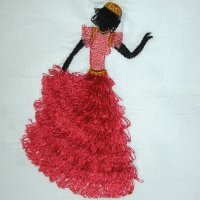 The Frilly Ethnic Ladies can be used to embelish table cloths, table runners, that special quilt or bed cover, or even shopping bags. 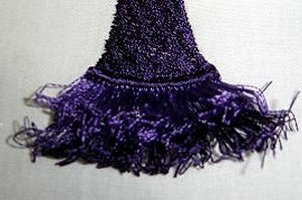 NOTE: The tention on your machine should be correctly set to successfully sew these fringework designs. 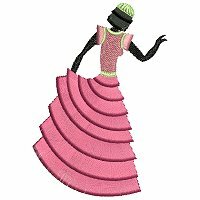 When sewing column or satin stitches, the back side of your embroidery must show approximately one third top thread, one third bobbin thread and one third top thread again. 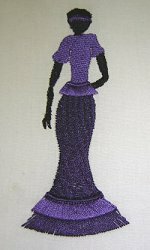 This can be seen on the righthand photo below, where the purple top thread is visible both sides of the white bobbin thread on the two rows of satin stitches, on the lowerpart of the design. Step 1: Sew the design. Use a medium to heavy cut-away stabilizer. 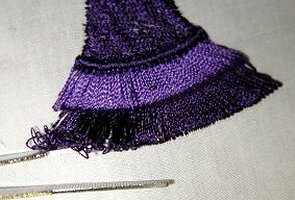 This will help the "anchor" stitches to hold the frills once the bobbin thread has been cut. Step 2: Turn the finished design over and carefully snip the bobbin thread on the two rows of satin stitches. 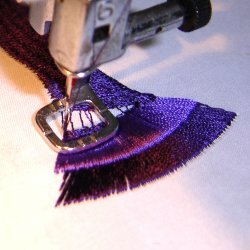 Use a small scissor with sharp points or a seam ripper. Step 3: Turn the design right side up again. Insert the tip of your tweezer or other blunt tool under the satin stitches. 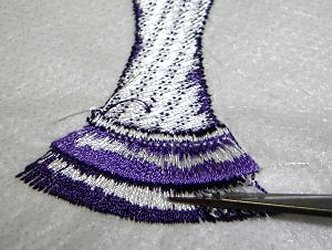 Carefully pull the satin stitches to the to of the material.